Terry graduated from Livermore High in 1961 and I graduated 1962. After Graduation Terry attended San Jose State College, I had one year left of high school. Terry proposed to me and we were engaged the night of my high school graduation. 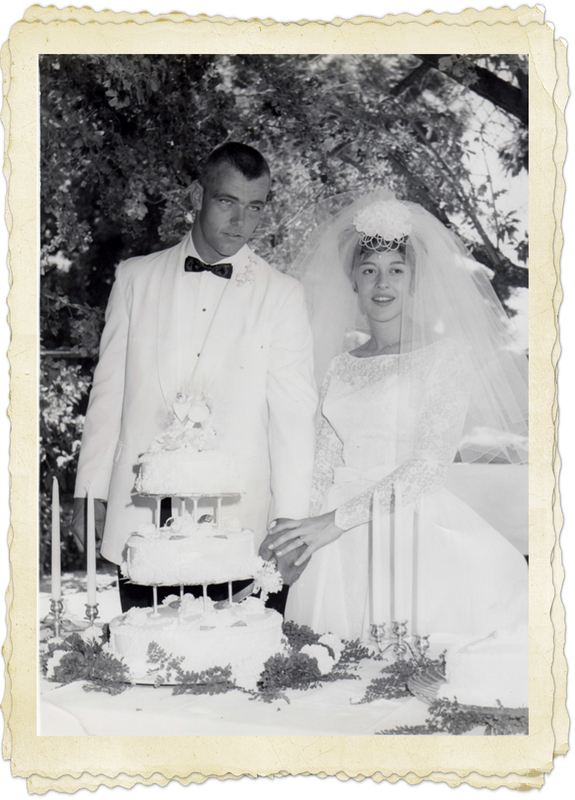 The wedding was planned for July 20, 1963. We were so young I was 18 Terry was 19. It was a traditional Italian wedding, a very warm day, and the reception was at the Pleasanton Hotel, Pleasanton California. 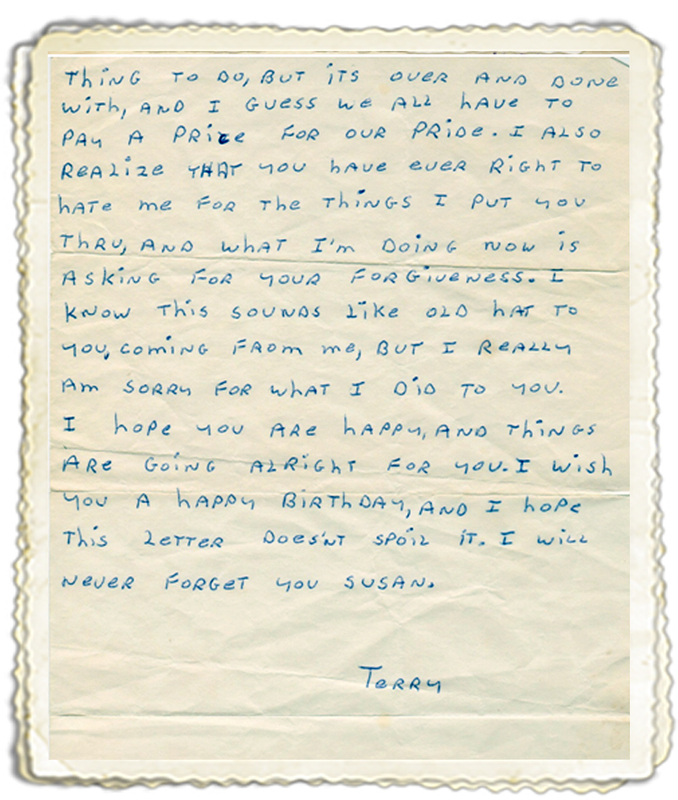 Terry and I separated April 1964. As we looked back our marriage failed primarily due to immaturity. So in August 1964, my parents thought it was best for me to leave Livermore and move to Denver Colorado where my sister and her husband lived. My parents soon moved to Santa Maria where my mother’s sister and family lived. They were only there for a short time then moved to Salinas where my mother’s other sisters and mother lived. Terry came to Colorado hoping we could work out our problems and get back together. He called my sister’s house; she answered the phone and told him “no you can’t talk to my sister”. Now you must realize that my sister was 4 years older than me and very protective so she felt she was doing the right thing, I was never told Terry called. After our divorce Terry was drafted into the Army. 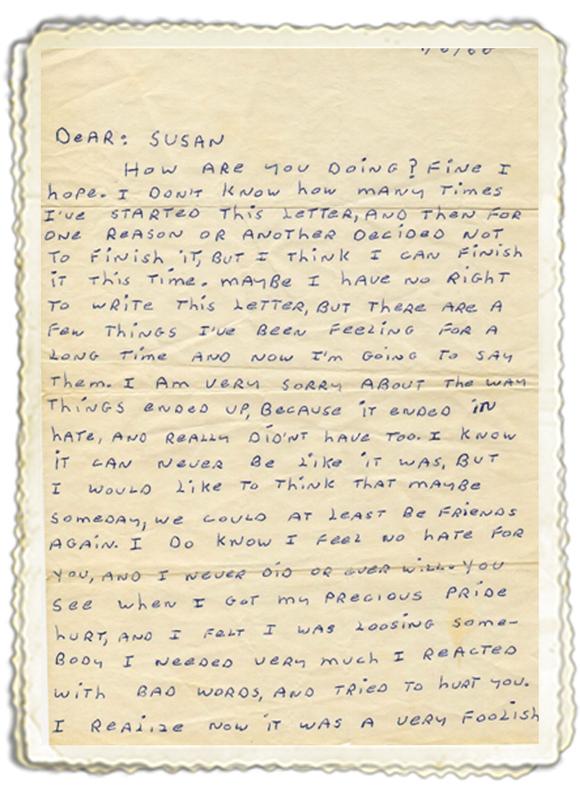 He wrote a letter to me at my sister’s address before he was sent to Vietnam. 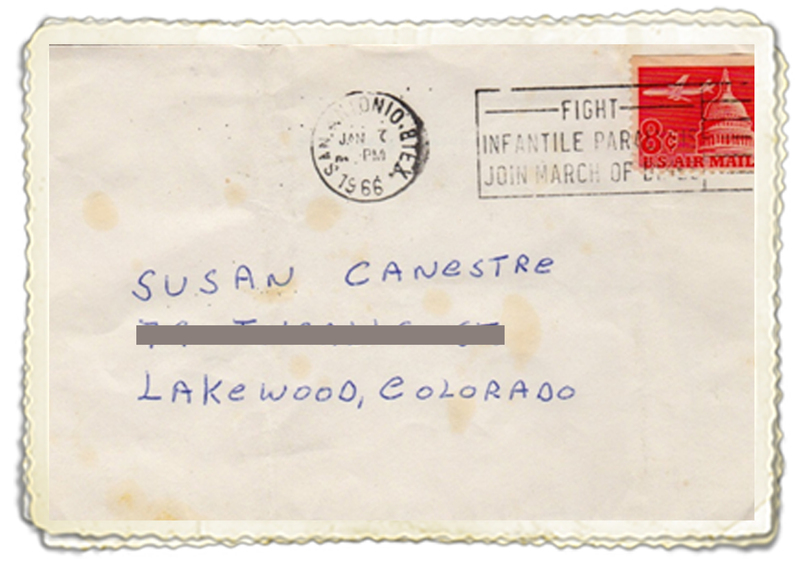 The letter was intercepted; my sister sent the letter to my mother and I was never told there was a letter. Terry came home from the war, married had two daughters, went back to college got his PhD and his life went on. Terry’s 2nd marriage failed along with his 3rd marriage. I got a job working for 5 attorneys and was living with my sister and her husband. My sister’s brother-in-law’s wife had a brother who had just divorced his wife so they thought it was a good idea for us to meet. 2 months later I was married to Mike Hodges. We were both on the rebound; however we attempted to make a go of it. Life went on for me; I had three children two girls one boy and moved to Kansas for a few years. My father passed away in February 1979, so after the funeral I was very home sick missing California and talked Mike Hodges into moving to Salinas to be close to my mother. Then 9 years later in 1988 after 24 ½ years of marriage Mike & I ended our marriage. I was now a single woman, working for PG&E, long hours, trying to keep my family together and care of my mother who was diagnosed with Parkinson’s disease. My mother passed away January 2002. While getting her house ready to sell, I found my (original) wedding album in her garage, along with the letter from Terry, I’d never received. I was so overwhelmed, I went home and googled Terry's name. A picture came up which I immediately recognized, he was a manager of Human Resources for the State of Oregon, living in Salem, OR. 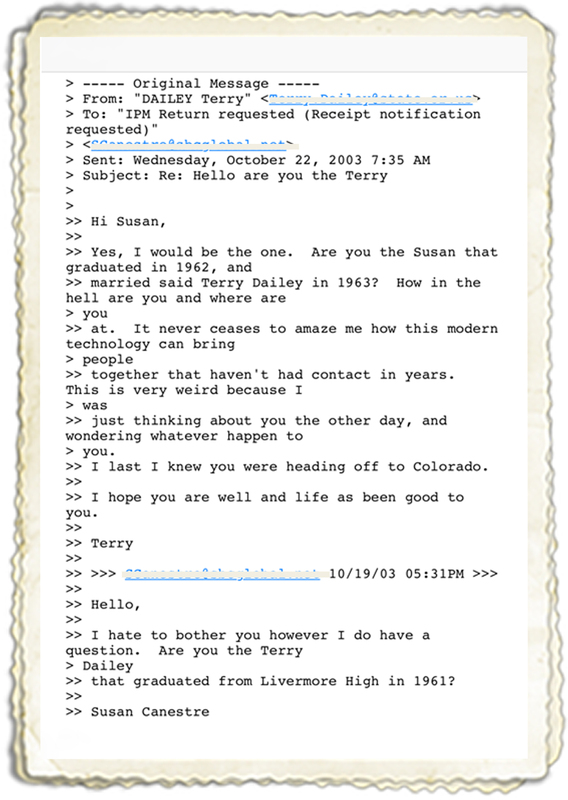 I sent him an email on October 19, 2003, and he responded 3 days later. I really gave him a bad time about waiting 3 days to answer. We emailed each other and talked every night, we had 40 years to catch up on. We decided Terry would fly down to San Jose and we would have dinner. December 11, 2003, he arrived, we had dinner and discovered 40 years had not changed our feelings for either one of us. May 25, 2004 we had a trip to Maui. 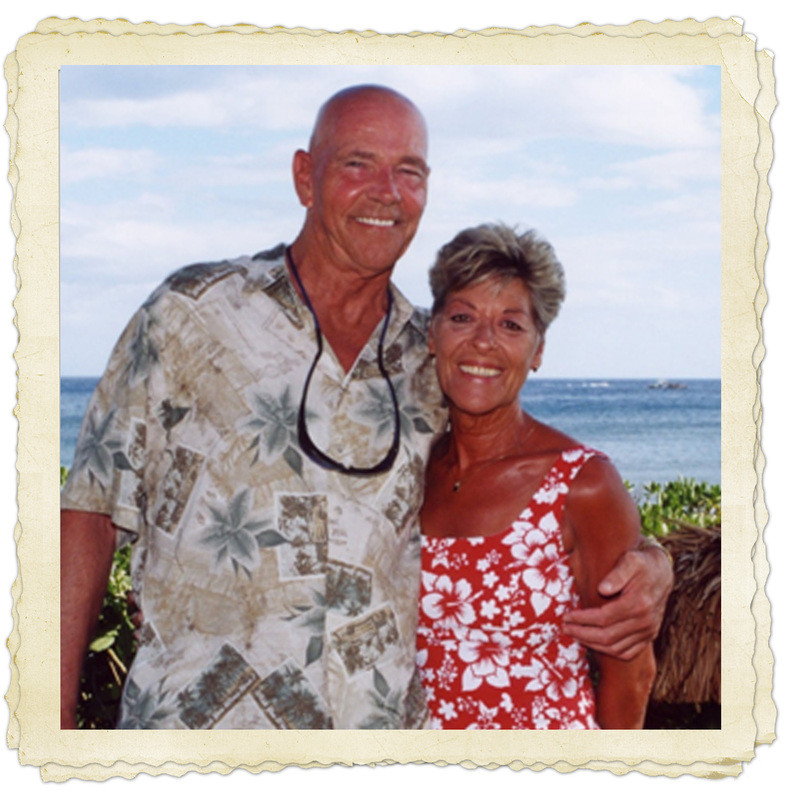 While we were on vacation in Maui we decided to retire, sell our homes and move to a warmer climate. We found a small retirement community 12 miles South of Tucson, AZ (Sahuarita). 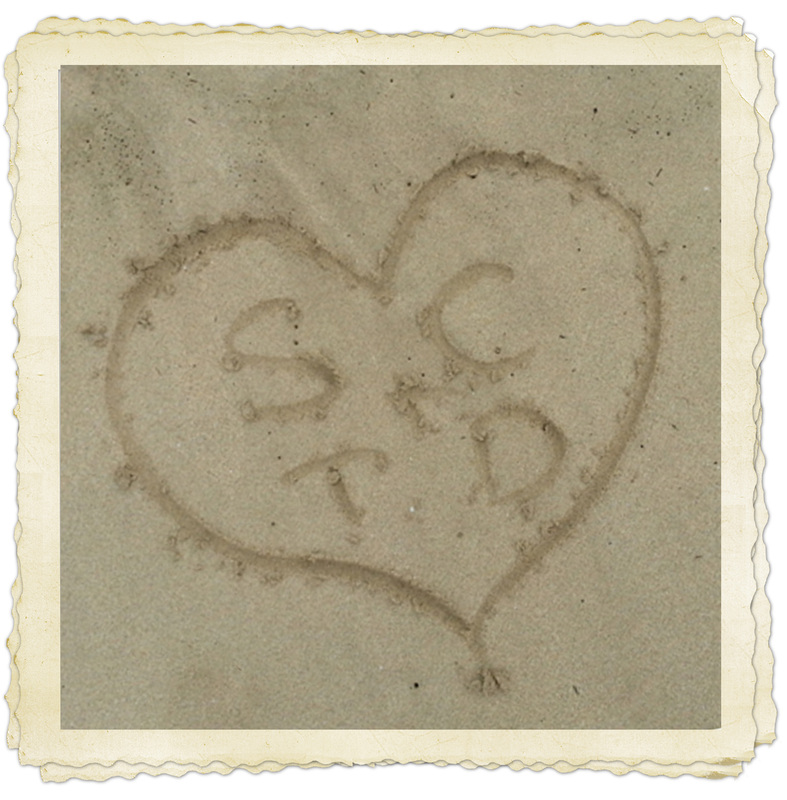 We bought a home traveled and enjoyed life to the fullest for the next 12 years. Thanksgiving Day 2015 Terry became ill and was diagnosed with inoperable metastatic lung cancer, even thought he’d quit smoking 20 years ago. 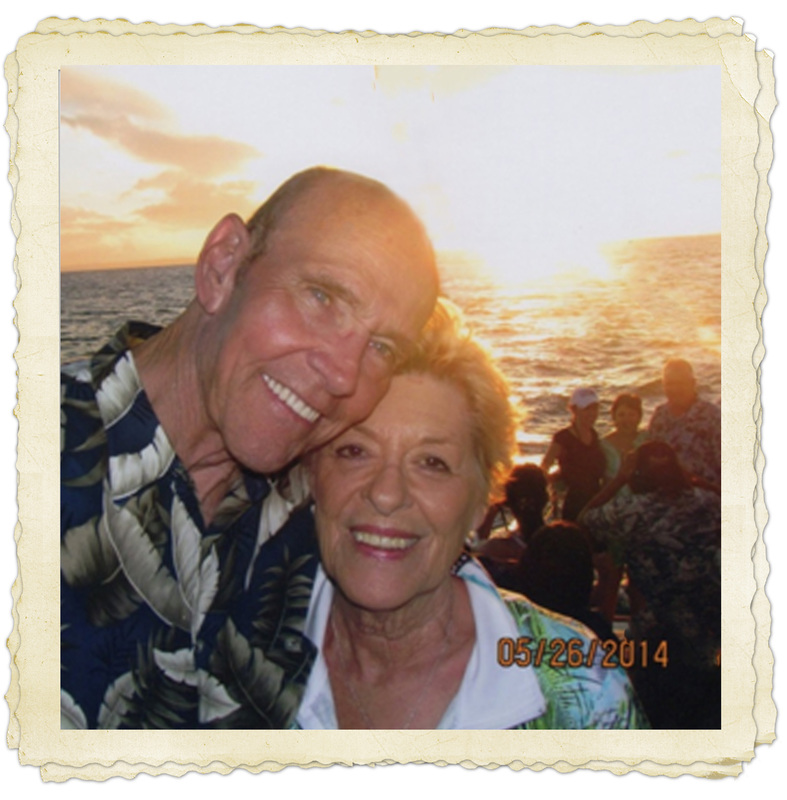 The love of my life passed away September 17, 2016. I was fortunate enough to keep him at home and hold his hand until his last breath, I miss him so much. I’m a firm believer that everything happens for a reason, we were lucky enough to find each other through this wonderful computer world we now live in. I miss him so much, but I am so thankful for our time together. April 27, 2017 I opened an envelope from a name I was not familiar with, Linda Trudeau, and there were 7 pictures of my wedding. For a moment it took my breath way. I googled her name found a phone number and called and talked to this wonderful woman who had just witnessed the birth of her 6th grandchild, the same day I received the pictures she had mailed to me. Thank you so much Linda, I needed to get our story on paper, believe me, this has helped me get through this very difficult time of my life. I’ve also attached a message that I have framed which I read every day. I had so many questions; Linda’s parents were next door neighbors to my parents. Her mother still lives in the same house. Her father loved photography and had taken pictures at my wedding. While going through photo albums with her mother she got my name and address googled it and mailed me the photos. Linda didn’t know the rest of the story, she was told we divorced and knew nothing of our re-connection, so when I called her and told her the rest of the story I knew I had to put this story on paper and send it to her. Once again thank you Linda. Maybe someday we can meet. I found her easily in the white pages, an address in Salinas CA where I knew they were, but then a newer address in Arizona. So I sent them off…. Going home from the hospital after our grand-daughter, Cassidy, was born, my cellphone rang... the number comes up on the screen in the car, I didn't answer it, 1 min later it rings again, ok someone wants me, as I’m in the McDonald’s drive-through ,.. she says,"Linda Trudeau", I say "yes", she says "Susan Canestre", I said "you got my envelope … wait let me order my breakfast..." Our conversation ensued as I drove for an hour, I asked if I can share her story on my blog. She said, "yes of course..." She wrote it for me the next day, sending in email, and I share it here with you. Sometimes people come into your life and you know right away that they were meant to be there... to serve some sort of purpose, teach you a lesson or help figure out who you are or who you want to become. You never know who these people may be but when you lock eyes with them; you know that every moment that you are with them they will affect your life in some profound way. And sometimes things happen to you at the time that may seem horrible, painful and unfair, but in reflection you realize that without overcoming those obstacles you would have never realized your potential, strength, will power or heart. Everything happens for a reason! Nothing happens by chance or by means of good luck. Illness, injury, love, lost moments of true greatness and sheer stupidity all occur to test the limits of your soul. Without these small tests, life would be like a smoothly paved, straight, flat road to nowhere, safe and comfortable but dull and utterly pointless. The people you meet affect your life. The successes and downfalls that you experience can create who you are, and the bad experiences can be learned from.... In fact, they are probably the most poignant and important ones. If someone hurts you, betrays you or breaks your heart, forgive them because they have helped you learn about trust and the importance of being cautious to whom you open your heart. If someone loves you, love them back unconditionally not only because they love you, but also because they are teaching you to love and open your heart and eyes to little things. Make every day count! Appreciate every moment and take from it everything that you possibly can, for you may never be able to experience it again. Talk to people who you have never talked to before, and actually listen. Let yourself fall in love, even if it doesn't seem right because you are too young just follow your heart. Surround yourself with those who make you smile, laugh, and make you happy. Break free and set your sights high. Hold your head up because you have every right to. Tell yourself you are a great individual and believe in yourself, for if you don't believe in yourself, no one else will believe in you. Create your own life then, Let go and live it!